I’ve been playing Splatoon 2 quite a lot recently and it’s made me realize a few things about how I prefer to play games. Splatoon 2 is the first game I’ve gotten into (outside of Pokémon or Mario Kart) That has some sort of competitive aspect, and I can see in a more direct way, how my playstyle differs from others. I tend to prefer close or mid range weapons in games that are reasonably fast. Long range weapons always trip me up and weapons with a lot of power but low fire rate do the same. I think this probably has something to do with my inability to aim well at long range, but also with how I fight in real life. I’ve studied Taekwon-Do for many years (I don’t attend practice as often as I should any more due to school/work), and in real life my fighting style resembles that of how I play in game. I prefer to get in close when fighting someone who is significantly larger than me and hit at areas with sensitive nerves. Since I can’t beat them in power, I can at least beat them in speed, and at close range a jumeok to the throat will hurt like hell, regardless of the size difference. I think that mentality of getting in close and prioritizing speed carries over into how I play games. So, what’s your preferred fighting style? How did you come to develop that style? Do you have a preference at all. Though in real life I have no aspiration to learn any fighting. I wouldn’t call myself a pacifist but I have no motivation to beat someone, even for sports and hope I never come in such a situation. In a battle there would probably be a lot screaming, tears, scratching and biting. It would get ugly one way or another :). I tend to go for precision and controlling pace. I love ranged weapons, not just for dealing with opponents, but maintaining position and shaping the match in a way that suits me. In shooters, I'll generally play with some kind of sniper rifle while constantly changing position, but I haven't played any shooters in a while. In Street Fighter I play Dhalsim, in Melee I play Marth---I just like having my own space and playing off of how range can be used to manipulate other players. I really like playing with people who have a more aggro style though, because it leads to my playstyle being prioritized less over my teammates, which if anything makes my playstyle even stronger. I'd like to play competitive games more, but I just have too many singleplayer games to play and don't really have the network or enthusiasm to play with other people most of the time. Is grenade launchers a fighting style? It's very hard to describe but I think that I like to think of myself as a glass cannon type but am actually more of a hide in the corner type. Case in point: I mained Akuma in Street Fighter 4 but basically played him like zoning Ryu with a teleport (ie. dumb) and spoiler: I sucked. I think Dhalsim is probably more to my strengths but less fun. I guess that brings another question: what do you like to do vs. where does your strength lie? Of course winning is usually a big help in deciding what's fun if it means playing lame, maybe not. Splatoon 1 I used Carbon Roller, because it was so fun going fast and always throwing yourself right into the center of the action and dunking people, but then they ruined Rollers in 2, so I tried to find another fast, close ranged fun weapon. For awhile I played with Ink Brush, because I sometimes would play that in 1 to shake it up during Splatfests, but to play well that weapon requires excessive trigger mashing, and honestly my hand can only take it for so long, so I definitely needed a new proper main. Dualies were the big new addition for 2, and dodge rolling with them is really fun and useful, so I tried a bunch of those out looking for a favorite, but the originals ended up being my favorite for the longest until the power drills came out. 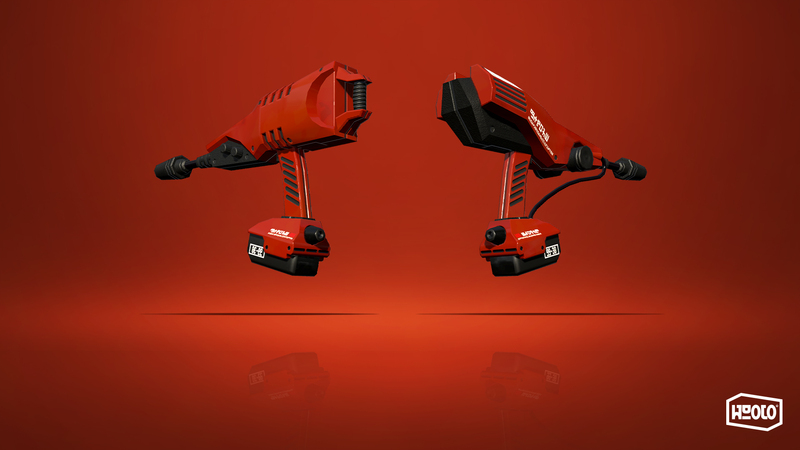 Even though the Dualie Squelchers don't ink as well as weapons I was used to, their range opens up more way options of stuff to ink and allows me to control territory more effectively. I still get the advantage of the defensive dodge roll you get with all Dualies, but I can also offensively dodge roll to combine them temporarily to shoot a concentrated blast a little further with them. I just find them a little more versatile than Chargers which are even harder to ink with, and are so hit or miss when my aim isn't the best. Their speed and range help me support teammates as well, so even if it isn't as exhilarating as being right up in your opponent's face, well I enjoy them. If I had more experience with shooters, better aiming, and quicker reflexes I'd probably go full Bamboozler 14 Mk I though. The DPS on them is insane last I looked, and I respect anyone with the nerves to nail those shots in the thick of the action. Splatoon franchise example aside, that's pretty much me in every game. I never really have specific preferences, and ones I do develop tend to get broken pretty quickly. I guess I'm not really a fan of one-handed swords, because they feel so basic, common, and forced in so many games. I'd rather have any other weapon. Giant two handed swords are great though. There's a couple styles over the years that have stood out significantly to me though. If you've never heard of Ragnarok Online, it was this Korean MMO that had tons of classes and weapons with lots of different play styles and builds dependent on stats, skills, and these super rare cards you can slot into your gear to add special effects. One of the special, very rare weapons they later introduced to the game was this spellsword called a Firebrand that was basically a one handed fire sword, (remember how I hate these?) but what made the weapon super cool was every slash of it had a chance to proc a low level Firebolt spell. Even better, every shot of the resulting Firebolt spell had a chance to proc another copy of the Firebolt spell. The chances were pretty low for initially triggering the effect, but once you got lots going it had a tendency to maintain a constant stream of bolts. So what I did with this weapon was slapping it onto my tanky Crusader, using a skill called Reflect Shield that would automatically return a hit every time I was damaged, and throw myself into mobs of monsters. Crusaders can heal themselves, so all I had to do was fling myself into mobs of enemies and manage my hp, while the entire time enemies are constantly proccing firery death from above off reflected damage they themselves caused! I didn't even have to attack. Ultimate Karmic Pacifism. My surroundings would just turn into a cloud of bolts that individually didn't do much, but when the enemies all take fifty in a very short timespan, well they just melt. Later I got an Ice Falchion that let me do this same thing to enemies resistant to fire with Ice Bolts instead. Even later I got a card to slot into my shield that would proc heal spells on myself rarely from "attacks", including the bolts, so I could just throw myself into mobs and go afk. Okay, that got pretty long, but it was just really cool. Speaking of really cool, there's this other game I didn't play for very long called Dungeon Fighter Online, and one of the classes from that was one of the most satisfying things I've ever experienced in a video game. They're called Grapplers, and they specialize entirely in barefisted brawling, holds, kicks, etc. which is already fun, but it gets better. So imagine a beat 'em up style character, except you can jump high and act like Mario bouncing off a Goomba to get serious air multiple times in a row bouncing off enemies, damaging them, ending your combo by grabbing the last enemy you land on, and launching it into whoever is left or a wall for a massive damage burst. I hope one day others realize how amazing this was and lift it to create a full blown beat 'em up with the same properties, because damn it was some crazy fun. That's enough for now. Might post more later. Either i try to maneuver around while taking them out, or i charge head on with all of my strength. My first style is really apparent when i'm playing shooters that allow me to be fast moving (Doom, Wolfenstein, Quake). I also did this in the last two Uncharted games, the addition of grappling hooks and bigger, more vertical levels really made me show that mentality. My second style is shown in games where i don't have the advantage (against creepy or stronger enemies), or when i'm given the chance to upgrade my weapons to prioritize strength. This really shined in my play through of Prey (2017). I got the shotgun early on, and i quickly upgraded it's damage. Later on, i didn't even need to worry about getting discovered during stealth, if that happens i just run directly to them and one-shot the hell out of their ghostly bodies. It's hard to do this in most games, but the games that do allow this i will definitely do so.